Welcome to our online order form. Please click on the items that you would like to order. Also, please note that the following prices do not include a 5% handling charge, tax, and shipping charges. You will receive a confirmation message regarding the cost of the order before it is sent out. Thank you very much for using Super Blue-Green Algae Products! Super Blue Green� Alpha Sun�, Energy for Your Entire Body, is whole, complete Algae. Its cell walls contain a high percentage of glycogen, so it provides natural sugars critical to the health and vitality of tissues and cells. Alpha Sun also contains high concentrations of easily assimilated, vital minerals. It is truly one of the world's most powerful sources of "Energy For Life (TM)" Alpha Sun is available in Vegi Caps and tablets. Super Blue Green� Omega Sun� Energy for your mind. Omega Sun is the heart of the Algae with the cell wall carefully removed through our special separation process. The high overall amino acid content of Omega Sun makes it an abundant source of raw materials for building the neuropeptides, which feed and enhance brain activity. Alpha and Omega work together as an unmatched "balance and harmony team", providing the fundamental nutrients your body needs. 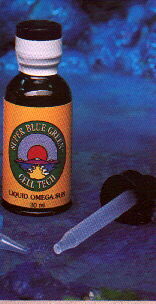 There is nothing like Liquid Omega Sun�, a pure, highly concentrated extract of Super Blue Green� Omega Sun� Algae. Liquid Omega consist of low molecular weight proteins that provide the autonomic and central nervous systems with immediate nutritional fuel to function at the highest levels. A few drops of Liquid Omega Sun held under the tongue for 30 seconds provide a remarkable benefit in today's high-stress, fast-paced world. To fully benefit from even the most healthy diet, your body must unlock and absorb the nutrients in your food. That's why enzymes are so important to your good health. Today's diets rely heavily on cooked and processed foods, and even when we do consume foods in their raw form, they are rarely garden fresh. The modern lifestyle has created a universal need for enzymes. 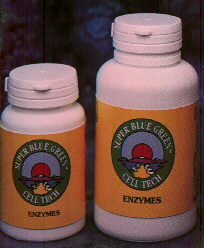 Cell Tech's Super Blue Green� (SBG) Enzymes contain a full range of food enzymes to help you digest all types of food, including fats, carbohydrates, protein, and fiber. SBG Enzymes are microblended with Alpha Sun�, making the Enzymes super-effective, so they go right to work the moment you consume them. (a) A super concentration of custom-grown wheat sprouts from the land. (b) Super Blue Green� Alpha Sun� Algae from Upper Klamath Lake. (c) Super Red Beta Algae, a premium strain of saltwater Algae from the sea. These three superfoods, taken together, supply the body with an extraordinary storehouse of antioxidant nutrition to neutralize the effects of highly unstable free-radicals. In research studies conducted in Mexico, wheat sprouts such as those in Super Sprouts and Algae increased the supply of antioxidant enzymes in subjects from 40% to 80%--- an effect that lasted weeks after the supplementation was discontinued. Super CoQ10 contains Super Blue Green� Alpha Sun� and a special enzyme called coenzyme Q10. This essential enzyme has been shown to be beneficial for proper functioning of the liver, heart and muscles. Coenzyme Q10 is especially important in helping the mitochondria to generate energy. Today, the cutting edge of coenzyme Q10 development is the synergistic combination of pure, premium coenzyme Q10 with our unique strain of wild, mineral-rich Super Blue Green Alpha Sun Algae. Cell Tech's Super CoQ10 is completely safe to consume since there are no reported toxic byproducts or side effects associated with excess or over consumption of CoQ10. It is the ideal way to assist your cells in converting nutrients into energy. Super CoQ10 Converting Nutrients to a Powerhouse of Energy! Acidophilus is the first of Cell Tech's amazing probiotic products. It helps balance the small intestine. Acidophilus plays a key role in helping your body get the most out of everything you eat by keeping your intestines healthy. Cell Tech's Acidophilus is uniquely designed to help you process your food quickly and help your body eliminate waste. It is a single-strain "friendly bacteria" called DDS-1 Acidophilus. Each capsule is carefully microblended with 85 milligrams of Super Blue Green� Omega Sun� Algae. Laboratory measurements show that the Algae "turbo-charges" the Acidophilus, making the healthy bacteria grow faster and in greater numbers. While Acidophilus serves the small intestine, Bifidus is a benefit to the large intestine. As the digestive system's primary element, the large intestine reabsorbs the water from our food and passes the remaining waste out of our bodies. When it functions properly, the large intestine can help prevent bloating, gas, and diarrhea. Cell Tech's Bifidus helps repopulate the large intestine with friendly bacteria. Bifidus helps restore the healthful environment the large intestine needs to do its job. The newest probiotic product from Cell Tech, Spectrabiotic is designed to complement acidophilus and bifidus in providing a complete system for building and maintaining healthy intestinal flora. This one-of-a-kind Spectrabiotic formula was created through the efforts of two of the most respected nutritional scientists in the world, Dr. Khem Shahani, the man who developed DDS-1 Acidophilus, and enzyme specialist Viktoras Kulvinskas. There are seven key "good bacteria" in the Spectrabiotic formula. They are microblended with 85 milligrams of Super Blue Green� Omega Sun� Algae to provide your entire digestive tract with superb probiotic support. Spectrabiotic is especially effective when combined in a regular program with Acidophilus and Bifidus. This all natural skin-care system is designed to work with your skin rather than on it. The Rivers of Light system nourishes your skin with quality natural ingredients, rather than cover it up with artificial cosmetics. Each of the Rivers of Light skin-care products-- Skin Cleanser, Facial Spray, Skin Creme, Moisture Mystique, and Facial Cleansing Mask-- contain no solvent alcohol, artificial perfumes, mineral oils, artificial colors, or animal derivatives of any kind. Rivers of Light Skin Care products are unique; they are bolstered by Super Blue Green� (SBG) Alpha Sun� Algae. This unique product provides essential minerals, enzymes and chlorophyll to help promote the flow of blood to the skin while enhancing overall health at the cellular level. By merging the benefits of the SBG dietary products with the Rivers of Light Skin Care system, you provide your skin with the perfect balance that will leave you looking and feeling young and vibrant. The Rivers of Light Hair and Scalp Products are 100% natural, containing no harmful ingredients such as coconut oil derivatives, lanolin, or cholesterol. The water base of this total hair and scalp care system is extraordinary, enriched by the incredibly pure water from the "Rivers of Light" that feed Klamath Lake. 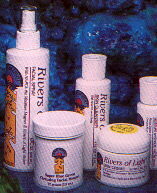 The Rivers of Light Hair and Scalp Care system is as simple as one, two, three. Begin with a few drops of Rivers of Light Scalp Cleanser. Then shampoo your hair with Rivers of Light Nutritional Shampoo. After shampooing, it's time for Rivers of Light Conditioner, leaving your hair and scalp fresh, healthy, and vibrant. For animals, just as for human beings, prevention is always the key to consistent good health. Super Blue Green Animal Food is a blend of course grade Alpha Sun and Omega Sun Algae, providing the fundamental building blocks for strengthening your animals immune system. For all your pets you'll find that this is the "ultimate superfood". One-third teaspoon sprinkled on each pound of your pet's food works out to be the ideal "ounce of prevention!" The perfect start up kit for getting started with algae! Kit includes one bottle each of Enzymes, Spectrabiotic, Alpha Sun, Omega Sun-plus an introductory audiocassete and program guide, a journal, and a key chain algae carrier all packed in a easy open box constructed of completely biodegradable products! There is no better way to begin the Super Blue Green Algae experience!